On November 13, 1837 Antoine Robidoux would have been traveling near the border of Utah and Colorado. There was a good chance that he was transporting trade goods between one of the trading posts that he established in the region. One of those trading posts was Fort Uncompahgre, which was located outside of what is now Delta, Colorado. Robidoux had also established the Uintah Trading Post in northeastern Utah. The Uintah Trading Post was alternately known as Fort Robidoux. Robidoux was born in Missouri in 1794 to Joseph Robidoux Sr. and Catherine Marie Rollet. His parents were of French-Canadian descent and his father operated a successful fur trading company in St. Louis, Missouri. Antoine took after his father’s business practices and set his sights on the fur trade in the western United States. By the early 1830s he established his own company and his trade routes ranged from northern New Mexico to northern Utah. He was a fluent Spanish speaker which undoubtedly aided him in his business dealings. Eventually, he gained Mexican citizenship after marrying the Governor’s daughter in Santa Fe, New Mexico. Robidoux was also on friendly terms with the Ute People during certain times of his life. On November 13, 1837 he carved an inscription on a sandstone wall in Utah. 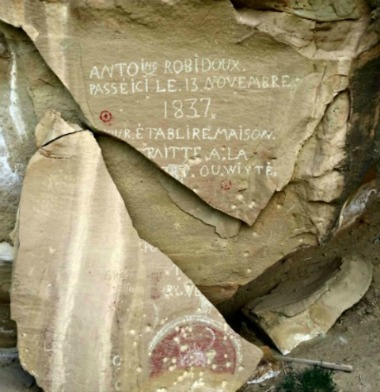 The inscription, which was written in French, reads “Antoine Robidoux passed here to establish a post at the White or Green River.” In the same area of the 1837 inscription is evidence of his later travels through that region.